Seems Potter mania is kicking off with the media blitz today (well, technically last night), setting the stage for the upcoming teaser trailer. 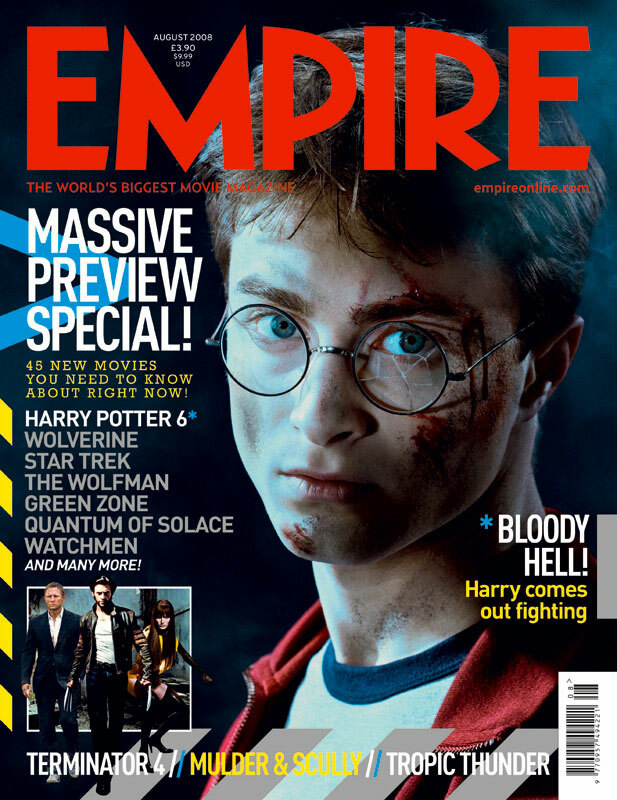 Here’s a new photo from the cover of Empire magazine. I’m totally getting psyched for the next Potter movie…Hard to believe Order of the Phoenix was already like a year ago. There’s a new trailer up for the latest Bond film, which surprisingly hits in just a four months! After watching the new Quantum of Solace trailer a few times, I must say it preserves the feeling of Casino Royale, while also creating some new iconic images. In particular, I love that shot of Bond slowly coming up over the rock cliff with the reveal of the machine gun in his hand. That’s a screen capture for wallpaper on the computer if I’ve ever seen one. Do yourself a favor, and head here to watch the trailer! Saw Get Smart this morning….sad to report that there’s no Harry Potter trailer attached to this WB movie. I think it’s beyond impossible that it won’t show up now in a few weeks with The Dark Knight. That’s the most high-profile release left yet…..There’s good trailers on the horizon….I’m willing to bet almost anything that a Quantum of Solace trailer hits with Hancock. Looking forward to the weeks ahead. Fueling my disappointment with Indy 4 was the lack of any big trailer debuts….Indy isn’t tracking as high as I thought it would box-office wise, but it is a very big debut and millions are heading to theaters over the holiday weekend, so any studio wanting people to know about their movie would be dumb not to take advantage. Instead, I was stuck watching a trailer for something called Benjamin Button (something to that effect, anyway) that looked really weird, a trailer for a heavy-drama Australia, and a bunch of really old trailers I’ve been watching for months. Where’s the Potter trailer, The Mummy 3 trailer, Star Trek, or something else that would have been unexpected….Quantum of Solace, anyone? Hopefully in the coming weeks, trailers will start to improve as even more summer blockbusters are released. I hear the Potter teaser will be in Get Smart, which doesn’t quite make sense, but I’ll still be seeing it anyway because Carell looks hilarious in the role. Look for updates later this week…I’ll be out of town, but will still be on the prowl for movie news. /Film has the new trailer up for The Incredible Hulk, and I think I was totally in the second I saw the Hulk using demolished wreckage (cars, I think) as boxing gloves. This one just moved up a notch on my anticipated list….Hulk smash!!! Go here to choose what version to watch. Looks like the perfect summer blockbuster event! Can this week get any better than it already has been? New The Dark Knight Trailer! I was lucky enough to find a few of the blogs I read posting bootlegged versions of the latest Dark Knight trailer that’s due out soon (apparently next week). I think Heath Ledger’s final perfomance will garner a lot of praise from fanboys and general moviegoers as well, because his incarnation of the Joker appears to be spot on, and easily the best that will ever be done. It is going to be interesting to see how they deal with it if they have to bring the Joker back, because it really seems like his performance is going to overshadow anyone who tries to take over. I’m really looking forward to this one now! Go here to watch it before it gets taken down! The final trailer is up for Transformers, and it’s a good one! I’m not really disappointed by the Optimus mouth anymore…. This movie looks great…I’ll be glad to rub it in how good it is to all the fanboys who are still mad about Michael Bay…..